PCI Scanning enables vendors to authenticate 10 fully featured on-demand PCI scans per quarter on up to 5 servers using the full complement of over 30,000 individual vulnerability tests with more added daily. The HackerGuardian Additional IP Address pack allows you to gain strength of scanning for additional external and internal IP addresses. Free PCI Scan is valid for 90 days and allows merchants to achieve PCI scan compliancy free of charge. PCI Scan Compliancy Service on-demand security auditing service. Provides PCI Scan compliance reports and includes free Payment Credential CVC. The data security standards set by the Payment Card Industry (PCI) are mandatory requirements for anyone who accepts, processes, or stores credit card data. 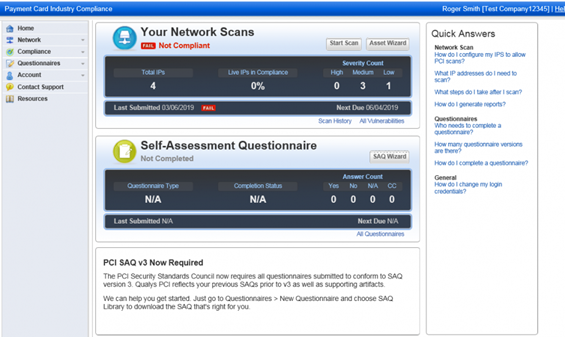 Comodo knows how painful PCI compliance can be, which is why we have created HackerGuardian PCI scanning and SAQ wizard tools to help make your path to PCI compliance as painless as possible. The HackerGuardian PCI scanning tool scans your externally-facing IPs and generates reports detailing any vulnerability found. It also supplies you with the information you need to fix any vulnerability issues. All the necessary documentation you need to send to your bank to validate quarterly PCI compliance is also included in our PCI scanning solutions. The HackerGuardian PCI scans offer scalable and flexible solutions for all your scanning needs. The data security standards set by the Payment Card Industry Council can be very confusing and daunting. Comodo understands how painful PCI compliance can be. This is why we've developed solutions for painlessly meeting PCI requirements. Thousands of organizations from level four merchants to enterprise level organizations choose Comodo for their PCI compliance solutions. With vulnerability reports, custom mitigation advice, and the necessary documents to send to your bank, our comprehensive PCI solutions help you every step of the way. Comodo realizes that complying with the security measures set by the Payment Card Industry is no easy task, but we also recognize that maintaining high level security online for all e-commerce merchants and their customers is something that will benefit everyone. This is precisely why we have simplified the PCI scanning requirement and annual SAQ into accessible methods to help you validate your compliance.